This project results from intensive and productive cooperation between French, Russian and Ukrainian Laboratories from 1995 to 2012, and in particular from the results obtained within the International Laboratory on Nonlinear Magnetoacoustics “LEMAC” (2004-2012). 1) Multistable nanostructures; Towards new paradigms for information processing. It consists of theoretical, experimental and technological studies of quasi-static and dynamic spin-reorientation phase transitions (SRT) in magnetic and stress-mediated multiferroic nanostructures and their application to the elaboration of new paradigms for information processing (in particular : ultra-low power nonvolatile random access memory MELRAM). CS materials are used as active media for supercritical parametric wave front reversal (wave phase conjugation WPC) of ultrasound with various applications for diagnostics and nonlinear imaging: WPC characterization of decompressed liquids and flows with microbubbles or nanoparticles, nondestructive testing using WPC of the nonlinear acoustic response of materials due to presence of defects. We investigate CS magneto-elastic materials with extraordinary nonlinear dynamics like multi-phonon bound excitations. The field of study includes hybridized quasi-phononic periodic structures (crystals containing periodic magneto-elastic insertions in a solid matrix) and studies of their new functionalities for innovative reconfigurable / controllable waveguides and resonators. As nanoscale CS structures the polymer chains with multiple structural transitions are studied. In the framework of the CPER-CIA North Pas de Calais project, the work is devoted to flexible functional electronic devices and microsystems based on ultrasoft metal/polymer active structures. Specific polymer processing, metallization, patterning and integration are developed with applications to agile millimeter wave antennas and phase shifters, micropumps and microvalves for fluidics. 4) Functional micro-fluidics & interface dynamics. This topic is associated with the analytical, numerical and experimental study of complex interactions between acoustic waves and micro-hydrodynamics : actuation of droplets / microflows by surface acoustic waves via nonlinear effects for labs-on-chips, Faraday instabilities, and microfluidic sensors and actuators for aerodynamic flow control. The project under consideration results from more than 16- years scientific collaboration established since 1996 from French side by the Institute of Electronics, Microelectronics and Nanotechnology (IEMN-UMR CNRS 8520) / EC Lille and from Russian side by the Wave Research Center of A.M.Prokhorov General Physics Institute of Russian Academy of Sciences (WRC GPI RAS). The initial field of collaboration was focused on nonlinear magneto- acoustics of solids and applications in ultrasonics. In 2004 the collaboration was formed as the European Associated Laboratory on Nonlinear magneto-acoustics of condensed matter (LEA LEMAC). The domain of activity was extended on nonlinear ultrasonic imaging based on parametric wave phase conjugation and micro magneto-mechanical systems (MMMS). The new partners such as Moscow State Institute of Radio Engineering Electronics and Automation (Technical University MIREA) and Taurida National University (TNU, Ukraine) were involved in collaboration. 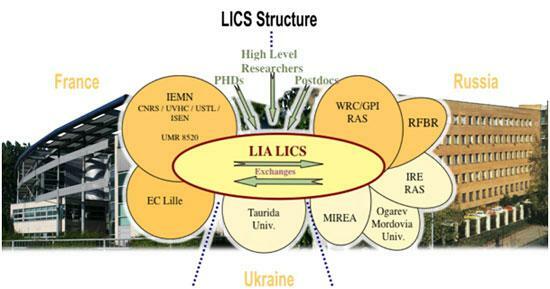 Taking into account the partnership with the Ukrainian University, the Laboratory was reorganized in 2008 into the International Associated laboratory (LIA LEMAC). The activity on micro-systems was extended on micro-fluidics and nanostructured active films and multiferroics. The results of LEMAC activity obtained up to October 2012 are published in more than 197 papers in the most famous scientific issues, presented in more than 232 international conferences, protected by 11 patents. 25 PhD theses, 2 theses of Doctor of Physical and Mathematical Sciences and 1 HDR were defended in LEMAC. The Laboratory carried out more than 30 European and National projects. Prof. V. Preobrazhensky : Medal from the SFA (Société Française d’Acoustique) 2005. Acad. F.V. Bunkin: Order of honour (President of the Russian Federation) 2005. Acad. F.V. Bunkin: Doctor Honoris Causa of the University of Valenciennes 2006. Dr. A. Brysev, Dr.L. Krutyanskiy, Prof. V. Preobrazhensky: L.Mandelshtam Award in Radiophysycs from the Russian Academy of Science (RAS), 2006. Prof. A. Merlen: Trophy of the Association Frances de Méchanique 2006. Acad. A. Sigov: Doctor Honoris Causa of Ecole Centrale de Lille 2007. Dr. F. Zoueshtiagh: Y.Zeldovich award 2008 (COSPAR/Russian Acad Sc.). Prof. V. Berzhansky awarded a Diploma of the Cabinet of Ministers of Ukraine for scientific and scientific-pedagogical activity(27.05.09). Prof. V. Preobrazhensky, Medal “For Contribution to Science” of State Fund of the Fundamental Researches of Ukraine, 2011-Prof. V. Berzhansky, Medal “Petro Mogila” of Ministry of Education&Science of Ukraine for achievement in education and science, 2011. Prof. V. Berzhansky, Medal “For Contribution to Science” of State Fund of the Fundamental Researches of Ukraine, 2011.